Everyone is welcome so tell your friends. That’s right! The time is here. Your entire lifes work has led up to this moment. Will you be able to step up to the plate, or are you gonna just drain. Thanks, to all who have showed up to the last few events. It was a good time and a great chance to practice under pressure. But now it counts, as of right now 42 people have pre-registered and I know of at least 10 more that will show but haven’t signed up yet. Not to mention the others that will show up the day of. So, expect to see your competition reach 60! Good luck to everyone and we will see you all there! For more information click on that colorful flier to your right!! Last week there were 17 participants. Let’s try to get 20 this time. Single game double elimination with no EB’s. Also this will be a good chance to pre-register for the Ground Kontrol so bring an extra $10 and avoid the hassle of using a computer. See you all there! Why yes, that’s around $85 that used to belong to other pinball players. Last night’s tournament at Ship Ahoy was a lot of fun all around, hopefully for everyone, and saw a great turn out– 17 (or was it 18?) players, and only 5 of them CFF members, made for a diverse group including some of Portland’s finest unaffiliated ballers. CAP, COW, eric and fred were all on hand along with a number of up-and-coming players, contesting Bounceback, Dropshot, ROM, Replay, Autofire, and friends for supremacy on 4 machines. All the games were playing well and felt like they’d gotten recent attention– MM had an altered flow to it, which worked in Bounceback’s favor, as he dispatched all comers on the machine, and by some strange workings of fate never even played a game on TOTAN or Indy. Even CSI was in top notch condition, though the operators were unable to install interesting modes or game objectives in time for the showdown. Some of the best news was the smooth running of the bracket system, tournament software, and machine selection techniques that will be used in the upcoming ground kontrol tournament. The organizers were all on hand and seemed to have thought of most of the possible contingencies that might come up during the larger tournament. So much fun was had that there’s talk of squeezing in one more chance for head to head action before the big event on GK. Stay Posted. If you’re interested in improving your game, there are few better ways to get the jitters out and improve your concentration than facing other skilled combatants, one on one, winner takes all. Like me! Big Winner, Pinball Champ! !!CHANGE!! Tuesday April 7th Ship Ahoy Tourney !!CHANGE!! Sorry everyone I thought we were a go, but I was later informed that Plan B is having dudes in short shorts singing songs or something that night. For those of you who made it to trackie day, it is not cool! So the tourney will be moved to the Ship. Plan B will just have to wait till next time. 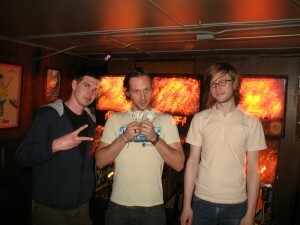 Come on down this Tuesday April 7th for a little high stakes pinball extravaganza. The tournament will be run on our super new super deluxe super sweet computerized bracketing program personally made for us by Bill Gates for the GK tourney. What can’t that man do? The tourney will start at 8 (please be on time or early for once) and the entry will be $5. Single game double elimintation winner take all, you know the deal. Hope to have a good turnout to tune our tourney running skills and YOU, yes YOU, need to win a pinball machine!